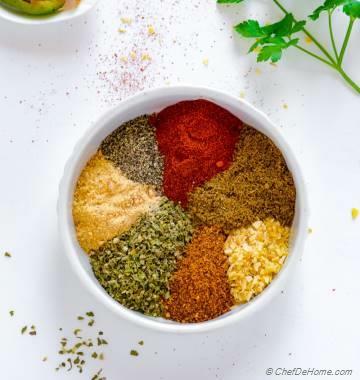 Learn how to make flavorful zaatar spice/seasoning at home, using fresh thyme. 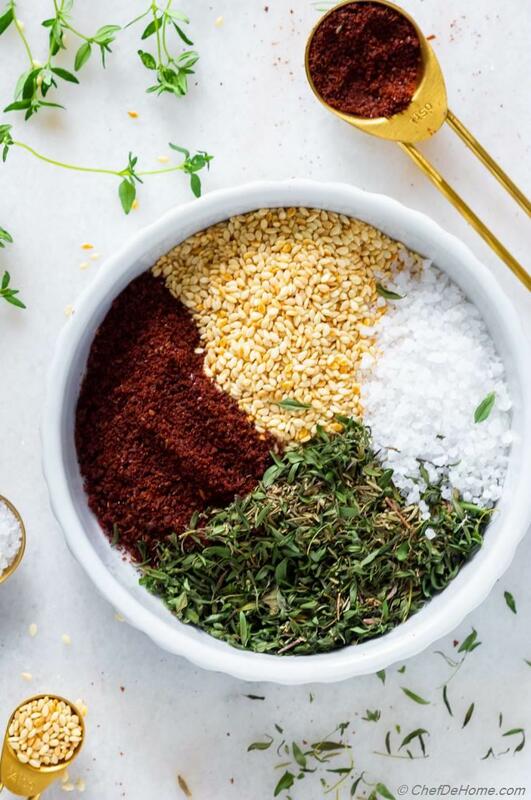 Za'atar is an amazing Spice Blend which is must-have in every Mediterranean food lover's pantry. When I'm looking to try some Mediterranean recipes, this is first seasoning I mix at home. If you have never tried zatar, this is perfect way to introduce a new spice to your family. Add it to hummus, sprinkle on salads or fresh fruit, or mix in yogurt for a delicious spiced yogurt dip. Options are endless. 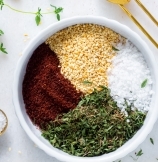 Za'atar (also spelled as Zaatar / Zatar / Zahtar) seasoning pack a punch of herb and citrus flavor, is very simple to make at home, and needs only 4 main ingredients: Thyme, Sumac, Sesame Seeds, Oregano, and Salt. (more on this ahead). Before I dig deeper into zaatar ingredients, let me share with you why make zaatar at home. Honestly, the main reason is the quality of ingredients. 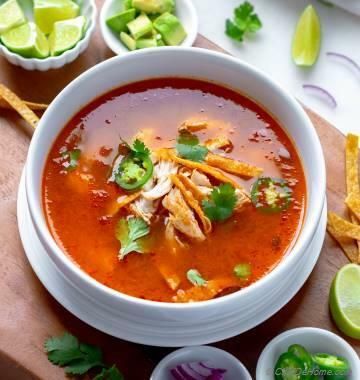 When recipe is such simple, the quality of ingredients define the flavor. Using fresh toasted sesame seeds, and fresh thyme (dried or just picked from garden) makes all the difference. During this time of year, my little backyard garden is blooming with fresh herbs (one of my favorite culinary inspiration). Specially, mint, thyme, and oregano grow like wild weed. When I have too much to handle, either I freeze'em or dry in oven. Thyme is wonderful herb when comes to freeze drying or oven drying (at home, no commercial oven needed). It retains it's green vibrant color and fragrance after drying. If you like to grow fresh herbs in garden. Use this simple recipe and never buy dried thyme again. To dry thyme, I pre-heat oven at 250 degree Fahrenheit. Wash thyme (fresh picked from garden or bought fresh from grocery store). Pat it dry, spread on a baking sheet. Bake for 12-15 minutes. Thyme will let you know when it is ready. (Kitchen is filled with aroma of thyme once it crosses the stage of moisture.) Keep an eye, don't let it burn. Use caution if your oven gets over heated. In that case either heat at 200 degree Fahrenheit only or leave oven door ajar. The resulting oven-dried thyme is crisp green and easy to take out from stems. Just rub gently in palm of your hands to separate leaf from stems. Along with toasted sesame seeds (look at recipe steps) and dried thyme.. I use oregano and sumac in zaatar spice mix. Oregano is my favorite addition to zatar specially when I'm using this as rub for meat. It adds very flavorful earthy notes. In stores you will find za'atar with or without oregano. If you don't have oregano, thyme alone will be sufficient. However, I won't say same about sumac. Sumac is the one main flavor-profile of zatar. Should not be missed. Sumac is a middle-eastern spice-blend with delicious citrus notes. Usually I keep a jar of sumac at home. Other than a main ingredient in zaatar, it is also my favorite seasoning in Fattoush Salad. You can find sumac in most US grocery stores (look in International Food aisle). I always find it in Whole Foods, Walmart, or Online. Note: The store-bought spice mix usually have very less sumac. In homemade blend, I use good proportion for a perfect punch of citrusy sumac flavor. How to Use Za atar Spice? Now that we have learned to make own Zaatar Spice Blend. Let's see how to use it in cooking. I usually make 1/4 cup of spice blend at a time. This way it stays fresh and consumed quickly in 2-3 recipes. 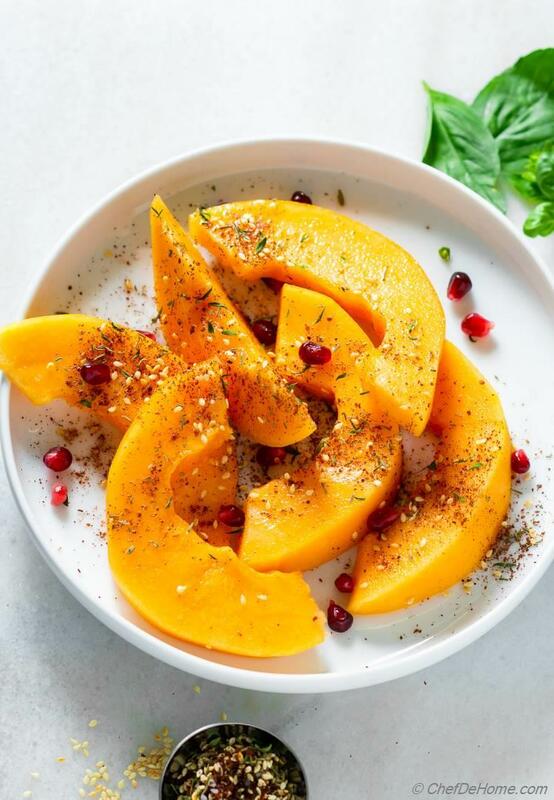 One of my favorite way to use zaatar seasoning is on fresh fruit. (just like you would use Tajin.) The citrusy sumac, nutty toasted sesame seeds, fragrant thyme, and pinch of salt. 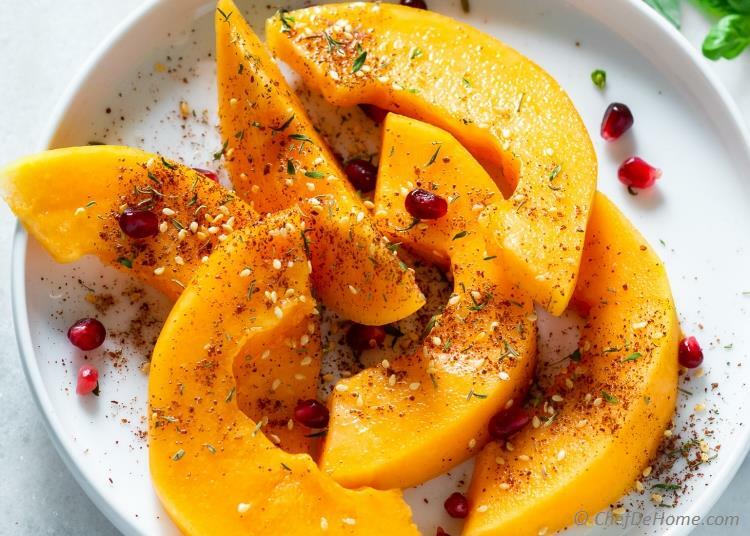 All fresh sweet fruits such as melon love company of zatar. In-fact, this is my favorite way to taste-test za atar after I just blended a batch. Fresh sliced melon, dash of lemon juice, sprinkle zaatar spice (liberally). Eat and enjoy! 1) Serve as dip for bread: Mix few pinches of zaatar in olive oil. Serve on side of fresh baked/toasted bread as herb dip. 2) Season yogurt, hummus, or salad dressing with pinch of zatar. 3) Mix with olive oil to make zaatar paste. Apply paste on meat before baking/grilling. 4) Spice-up fresh baked bread or dinner rolls. I have planned some recipes. Hoping to send some za'atar love your way. Save some seasoning! 1. Dry thyme: Pre-heat oven at 250 degrees Fahrenheit. If using dried-thyme, skip step 1 and 2. 3. Toast Sesame Seeds: While thyme dries, heat a dry skillet. Add sesame seeds and toast until most seeds are lite brown. (about 2 minutes). Keep an eye. Once skillet is hot, seeds are toasted very quickly and can burn if not observed closely. 4. 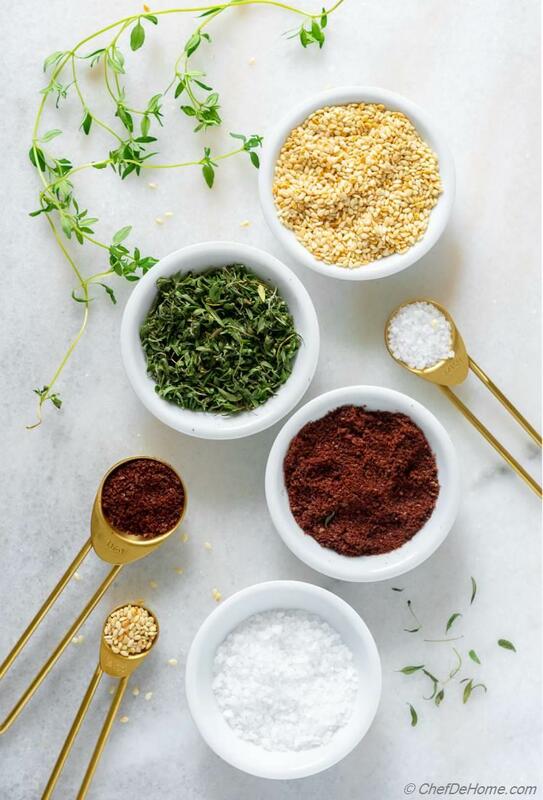 Assemble Za'atar: to assemble seasoning, mix all ingredients: sumac, **oregano, salt with toasted sesame seeds, and dried thyme. Keep at cool dry place in air-tight container for up-to 3 months. *Read Notes on how to use as zaatar seasoning. **Many Zaatar recipes also use Marjoram along with oregano and thyme. If you have some, you can try this variation. I, however, prefer thyme and oregano only. Store-bought Zaatar seasoning are greener in color due to above reason - more herbs than sumac. I prefer distinct flavor of sumac in zaatar. 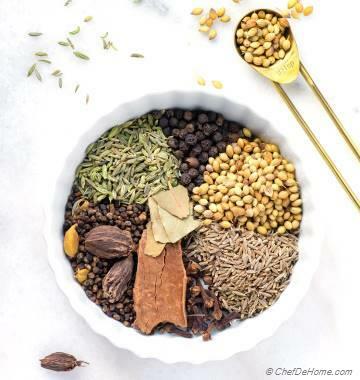 If you want more herbaceous flavor, add additional tablespoon of each dried herb. I recommend taste and try my base recipe before jumping to add any more ingredients. 2) Season yogurt, hummus, or salad dressing with pinch of zaatar.